We are a Voiceover Agency and Recording Studio in Woking, Surrey run by former BBC Radio 2 Newsreader Ricky Salmon. We have a huge selection of UK, Child, Teenage, International, Cartoon and Character Voiceovers. How can I join BigFish Media? We offer Voice Dubbing, Voice-to-Picture and "wild" recordings. 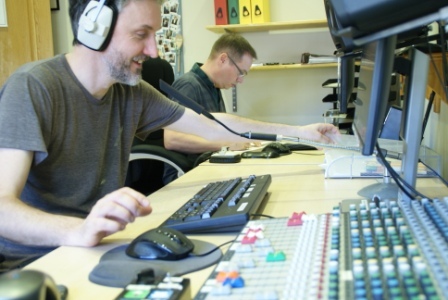 You can direct your voiceover session via ISDN, Skype, telephone or in person at our studio. The BigFish Media office and voiceover recording studio is located in a residential road near Woking, Surrey. We are just half an hour from London Waterloo and within easy reach of the M25, M3 and A3. There is plenty of free parking. Our studio is equipped with ISDN, Skype and ipDTL. It is also available for hire by the hour or day. Thanks for sending the audio so quickly. Fantastic service from start to finish! We record voiceovers for TV documentaries, radio and TV commercials, on-hold telephone messages, IVR, web videos, E-Learning programmes, explainer videos, Voice of God, webinars, corporate videos and mobile phone apps. You can listen into the voiceover sessions by ISDN, Skype, phone or in person at our studio in Surrey, UK. BigFish Media Ltd was established in 2004.